Cheerful Euphorbia, Heuchera, and Erysimum flowers wave in the spring breeze, while the blue-winged Pipevine Swallowtail Butterfly mingles in the air with honey bees. Rare and exotic trees like the wispy Kashmir Cypress and cartoonish Bunya-bunya tree tower over native irises and feathery yarrow plants. The WPA Rock Garden in William Land Park, built in 1940 as part of the New Deal’s Work Projects Administration, has become a haven for local fauna, a destination for gardeners and photographers, and a refuge for Sacramentans young and old. It wasn’t always such an Eden. When horticulturist Daisy Mah took over the garden in 1988, it was an overgrown ivy patch. Mah originally envisioned the space as a rock garden interspersed with alpine plants, but she quickly realized that drought-tolerant plants from the Mediterranean climates of the world would be more practical. In this regard, she was a pioneer during a time when water-loving plants like hydrangea and roses dominated public gardens. 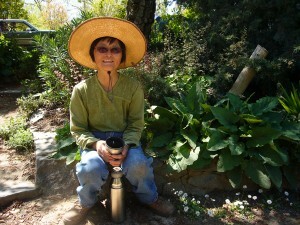 Mah studied horticulture at American River College, and went to work for the Department of Parks and Recreation in 1980. Her first charge was the McKinley Park Rose Garden; after nearly eight years she tired of the stodgy monoculture and transferred to the the WPA site in William Land Park. During her tenure there, Mah has created what looks like a primeval wilderness. Creating such a natural look can be a thankless effort, because visitors mistakenly assume it doesn’t require much creativity or maintenance. While all gardens require maintenance, a public garden needs even more upkeep. Tender seedlings get trampled by midnight visitors, rare bulbs are dug up and stolen, stone retaining walls senselessly torn down. Over the last two decades, Mah has tried not to fret over every disturbance and to maintain an emotional distance between herself and the garden – recognizing that a public garden is for the people. Nevertheless, it has become deeply personal for her, and a garden tour with Mah is like flipping through a family photo album. She has a story or memory for almost every plant in the garden. The banana shrub plants, for example, are meaningful because a neighbor in her hometown of Walnut Grove had one. 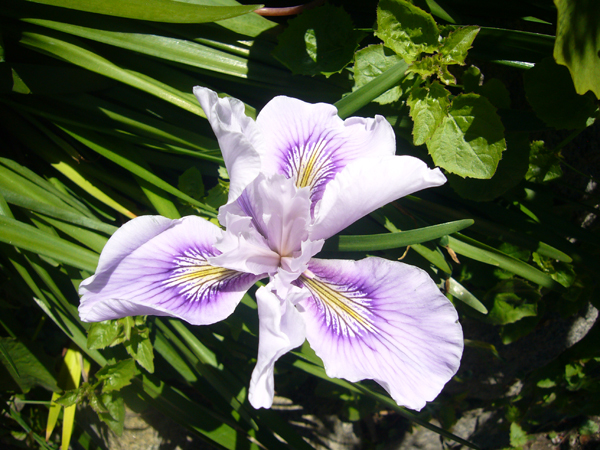 Her own mother was an edible gardener who had no use for flowers but as a girl Mah admired the plant for its beauty. 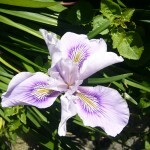 When the weather is warm, the flowers open and a banana-like scent reaches pockets of the garden. 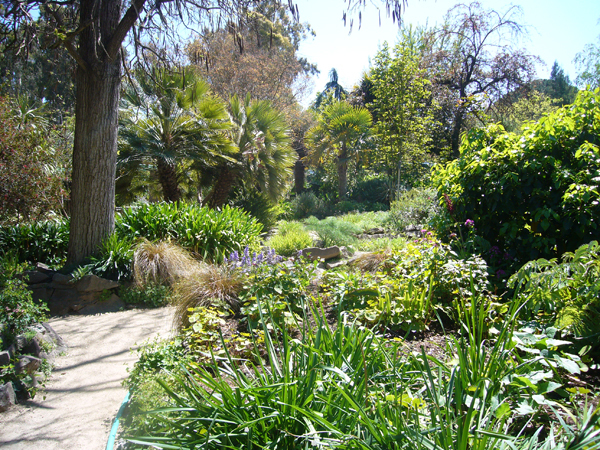 Many of the plants in the garden are not native to California, though they do have low water needs and thrive in Mediterranean climates like ours. But Mah is very proud of the sections devoted to California native plants, and has recently cleared a large section of thicket and replaced it with native seedlings and bulbs. She has been learning about the importance of creating habitats for diminishing populations of native fauna – years ago she planted a few pipevines in the garden in order to attract the above-mentioned butterflies and waited eight years for them to come. Currently researchers from UC Berkeley are using the garden as a study site for honey bee depopulation syndrome because the colony in the garden is so healthy. It is easy to take a place like this for granted – for many it is a nice path from the parking lot to the duck pond and nothing more. But it’s places like this that make William Land Park so remarkable. In a recession, people search for ways to entertain themselves without spending money, and on a sunny day, the park is a festive scene full of people romping around in the fresh air. Talking to Mah, one realizes how much work goes into a garden like this, and without much financial support. Mah makes good use of the city-owned nursery out by the Executive Airport and spends much of her day there propagating plants from seeds and cuttings. In today’s economic climate, with little money in the budget for public gardens, Mah’s propogation skills are valuable. The city has plans to close down the nursery, but SMUD’s Tree Foundation may take it over, and Mah hopes they’ll allow her a small corner to continue her work. She takes other cost-cutting measures by using the manure from the park’s Pony Ride ponies and turning it into compost. She has no employees, but she does benefit from the help of a handful of volunteers. Mostly though, Mah takes care of three gardens (she also tends two other gardens in Land Park – one on an island in Boat Pond which Mah reaches by boat; the other between Land Park Drive and the Amphitheater), and does all of the nursery work herself. She is a couple of years away from retirement, and though she clearly loves her job, she seems ready to relieve herself of some of her responsibilities. When asked about her plans for retirement, she lists her many clubs and volunteer projects. She is a member of the Perennial Plant Club and the California Horticulture Society. In addition, she works on three gardens on a volunteer basis: at Sutter Memorial Hospital, in Locke, and in Midtown Sacramento. The Midtown gig consists of the roundabout island gardens, which she tends as a member of the Green Thumb Brigade. It is difficult to imagine the WPA Rock Garden without Daisy Mah, and its equally difficult to imagine William Land Park without the WPA Rock Garden. Take a closer look the next time you pass by the garden – located behind Fairytale Town and next to the Amphitheater – and enjoy its hospitable atmosphere. Gardeners far and wide know of Daisy and her dedication. She is one of the most respected people in the plant community. It’s wonderful to see her recognized. I love the WPA garden and what it showcases. Daisy is a inspiration and a wonderful example to the rest of the garden community. Thank you for recognizing her efforts to beautify Sacramento. The rock garden is my favorite place in Sacramento. I went there often in the early 90s. I left Sac quite a few years ago, and visited the Garden last weekend for the first time in over a decade. It is even prettier than I remembered. Thank you for letting the public know the work and dedication that goes into maintaining it. Daisy Mah is a great civil servant and am very happy that you focused on her work as well as the beauty of the garden. Excellent research. The WPA Rock Garden in William Land Park is absolutely beautiful and lush with verdant and colorful life. I urge anyone to go there, and if you hav little kids, bring them along to take to Fairytale Town as well! We would love to schedule a tour of this wonderful garden with Daisy for ~20 of our members.